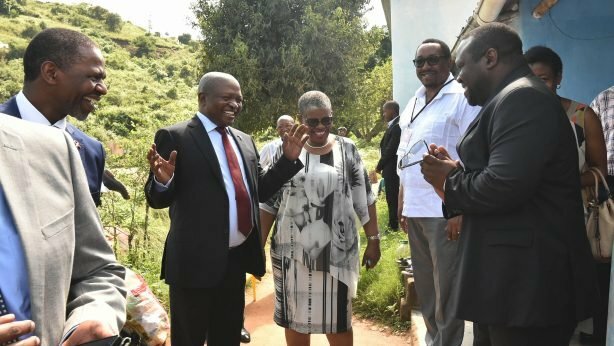 A Tanzanian delegation touring South Africa has stressed the role of political leadership in the AIDS response and noted the importance of matching policies and legislation to the responses to HIV and tuberculosis (TB). Led by Oscar Rwegasira Mukasa, the Chair of the HIV and Narcotics Parliamentary Committee of the United Republic of Tanzania, the delegation included Tanzanian Members of Parliament and representatives of the Tanzania Commission for AIDS (TACAIDS). Mr Mukasa said political leaders have an important role to play in uniting efforts in the AIDS response and harnessing domestic resources “so that we can stand on our own feet,” during the 13 to 15 February visit. The United Republic of Tanzania will take over the Chair of the Southern African Development Community (SADC) in August and the parliamentarians indicated they would use that opportunity to engage SADC ministers of health in developing policies on HIV and TB in the region. We need to align policies and legislation with technical programming for HIV and tuberculosis to ensure that we are in synch with the 90‒90‒90 strategy,” Mr Mukasa said. This was echoed in a meeting with Aaron Motsoaledi, Minister of Health of South Africa, who emphasized the regional nature of the epidemics of AIDS, TB and malaria and called on the United Republic of Tanzania to use its forthcoming leadership role in SADC to advance coordinated policies and actions. Mr Motsoaledi, who is Chair of the Stop TB Partnership board, reminded the delegates of the inextricable linkage between HIV and TB and noted that TB is the biggest cause of death in South Africa and of people living with HIV. 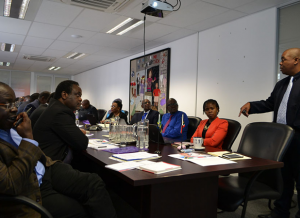 The delegates explored a range of issues, including the multisectoral response in South Africa, legislation, sustainability and service delivery arrangements, including public, private and community service delivery. The study tour included field visits to a community health centre and a medicine-dispensing ATM. 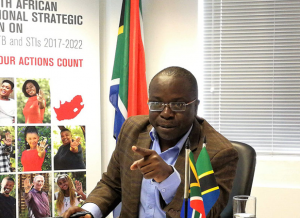 In a meeting hosted by the South African National AIDS Council (SANAC), its Chief Executive Officer, Sandile Buthelezi, told the delegation that HIV is still very much a health emergency. Noting the high burden of drug-resistant TB, he said that South Africa was adopting new treatment options. 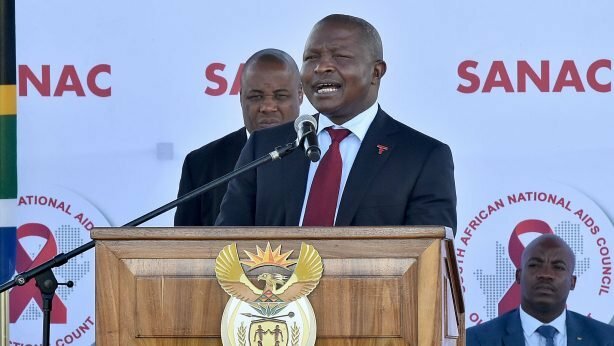 “South Africa has strong political leadership, yet still more needs to be done to reach our targets,” he said. Mr Buthelezi stressed the importance of engaging civil society and working with government institutions and the private sector to coordinate efforts and ensure that the needs of people at higher risk of HIV infection and people living with HIV are reflected in HIV programmes. Mbulawa Mugabe, the UNAIDS Country Director in South Africa, noted the considerable success in the region, but said there was a risk of complacency. “People are on HIV treatment for the rest of their lives and we need political commitment to invest domestic resources to sustain prevention and treatment efforts in the long term,” he said. Leonard Maboko, the Executive Director of TACAIDS, noted that the parliamentarians would use the results of their study trip to strengthen their national response, explore innovative service delivery models and advance a multisectoral approach. “Too often we talk among ourselves: we need to consult others on these issues,” he said.